I must brag on my daughter Amber for a moment. She just received her first year teaching evaluation. 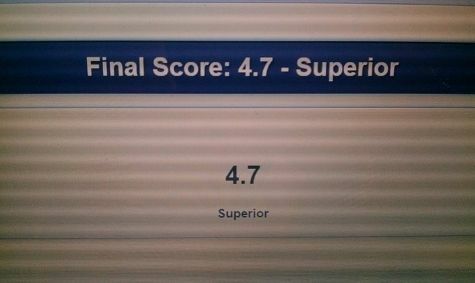 Out of a possible rating of 5, she received a 4.7 rating of Superior! Her principal told her it was the highest she had ever rated/scored a first year teacher. 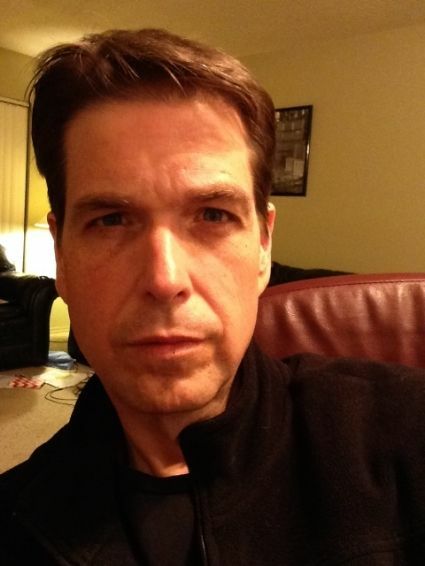 #tbt Throwback Thursday--all the way back to...Uh, January... There aren't any rules about how far back a "throwback" should be, right? This counts! Proud father here. Amber is an incredibly exceptional special education teacher. Letting the Tweets bring it the rest of the way home tonight. Hitting the pillow. It's back to work tomorrow--just in time for Friday! Not eating 2nd fish filet. Too much food! Calorie adjustment made in MFP. Revised dinner count: 484 cal. I accomplished a good deal of things today. I even made a point to catch up a little on rest. This short, two day stay at home vacation thing was a good idea. I have the vacation days coming, so I might as well use them when I need them, right? I'm looking forward to accomplishing even more tomorrow. I really had a good time in the kitchen today. I love to cook and I love what I eat--preparing good food and fitting it into my daily calorie budget is a fun challenge each day. The live-tweeting of my food has really inspired me to eat better. Upon starting this recovery from relapse/regain, I was really apprehensive about committing to the daily tweets. I referred to it as an "extreme accountability measure." And sure, perhaps it is. As off the rails as I was during relapse/regain--I desperately needed this added element. I certainly don't see it as a negative. It's been quite the opposite. The accountability factor has been golden. It occasionally inspires creativity in the kitchen. Check out the big pizza I made for lunch today...oh my...incredible and under 450 calories for the whole thing! It was a great food day. I ended the day 1 calorie over budget. I'll take that as awesome. I made today a rest day in the exercise department and I'm totally fine with that decision. It wasn't necessarily what I had planned this morning, but it seemed to fit well today. I'm planning on making it to the Y relatively early tomorrow for a good one. What do you envision your maintenance to look like? The reason I ask is because I have lost weight and I envision my maintenance phase to be exactly the same as my weight loss phase. I'm eating and exercising in ways that are healthy, enjoyable, and sustainable, and I assume that I will naturally settle at a healthy weight by simply continuing to do what I'm doing for the rest of my life (one day at a time, of course!). What are your thoughts on maintenance? And thanks again for your excellent blog! Great question!!! And my answer is pretty much word for word, your vision. I don't see much changing in the day to day elements of my recovery once I officially declare "maintenance mode!" The things I do each day should be things I do each day, for as long as I live. I've purposely made my elements of recovery enjoyable. It isn't a chore. I don't wake dreading another day of logging my food, being aware--staying within a calorie budget, abstaining from sugar, seeking and giving support when needed--or any of it... I enjoy what I'm doing. If there's any change at all, it'll possibly be adding a few hundred calories or so, each day and focusing on continuously developing my workout skills and experiences. The transition coming soon for me, may not be so easy to spot...that's how much it will look like what I've been doing for the last year. I must ask myself, for each element in my plan: Am I doing this as a means to an end or is this something I must embrace, always? For 90% of what I do, it's the latter. You're very welcome, Alison. This blog has been and continues to be an incredible blessing to me in so many ways. Thank you for your loyal support! It's time for more sleep without setting an alarm! Previous tweet didn't include 113g sugar free organic tomato basil sauce (1 serving), in the description. Not enough characters to describe! Two different people, independent of one another, said the exact same phrase to me today, "You're wasting away to nothing." What a horrible phrase! For one, it isn't true. Second, well--it's just a horrible sounding phrase! The translation: You've lost a considerable amount of weight. Great job. Aren't you about at the point of maintenance? In my opinion, judging from your appearance, you're at an optimal/healthy weight, right now. Upon embarking on this turnaround from relapse/regain, I was determined to not focus on a number. This hasn't been a quest to reach 230 again, although I reserve the right to be thrilled when I do. 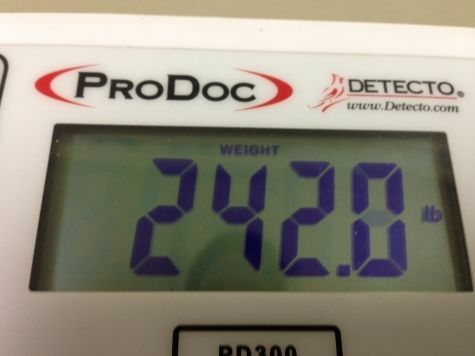 The point is, my healthiest weight may or may not be 230. My goal is to reach a healthy weight, whatever that is and dedicate my life to living within the boundaries of my successful recovery, each and every day. My buddy Jon in Wisconsin said it best, "The time you spend losing the weight is short compared to your goal of maintaining for the rest of your life." Okay--you know what? That might not be a quote, likely paraphrasing, but that was the point. And until he said it, I hadn't thought about it in those terms. 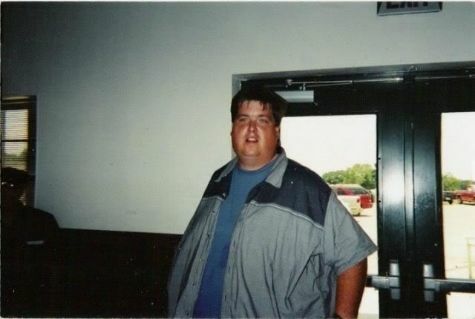 And by the way, Jon just crossed over the 200 pounds lost mark. Congrats Jon! I'm close to the point of saying, enough! All of my clothing sizes are back where they were at my lowest previous weight and that's a decent indicator. Still, I want to evaluate how I feel in the next 10 to 15 pounds and then make a decision about the transition into maintenance mode. Perhaps at 6'3" it is about 230, I don't know. I still think it's interesting that I basically pulled that number out of the air when I first started losing weight in 2008 and it actually was about right. I had zero experience to draw from in making the guess, just intuition I suppose. With additional workouts, specifically weight training, who knows? I might end up at an optimal 240 or 250 one of these days. As someone recently suggested in the comments section, it truly becomes more about overall fitness, less about anything else. I certainly don't want to waste away to nothing! I was the "celebrity bingo caller" at Woodlands Elementary Bingo/Raffle Night, tonight. This marks the third or fourth year for my involvement with this annual event. It's one of those things where I may not see quite a few of the people again until next time. I remember a couple of years ago, after regaining a significant amount, how I didn't really want to be there because I was full of embarrassment and shame for the regain. But you know what? They've always treated me well and never any different, regardless of my size/appearance. As I study the inner workings of me on many of these internal struggles, I realize how I've been the biggest judge all along. And any perception to the contrary was simply me projecting my own feelings onto others without their knowledge. I hurried from the elementary school gymnasium in order to get home for my weekly teleconference group support call. Usually I'm accompanied by Life Coach Gerri as a co-facilitator, but she had a big conference on her schedule this week. It was a good call, although I tend to go too long--and I did tonight. My lacking in the time management department applies to most everything I do, it seems. I felt bad about going long, simply because people have schedules--things to do, places to go--I must be more considerate. The extra fourteen minutes on the line tonight was just enough for me to put my dinner and the Y too close together. I made the decision to exercise with a brisk 2.7 mile walk at the trail instead of my usual YMCA visit. Most of the group participants seemed to be okay with the slightly longer than normal discussions. Still, I must continue learning the art of brevity. I get super passionate about this stuff, as you might have deduced. Discussing the ins and outs of what many of us are experiencing can quickly and easily turn into a long conversation. I'm taking vacation days from the radio station Wednesday and Thursday in an effort to organize several things I'm currently working on--things I've allowed to become sources of stress--and the stress isn't because of the things, rather, my handling/procrastination of those things. I've created stress and now, I'm dealing with it head on instead of eating my way through it! That's progress for a first class emotional/stress eater, I promise you! Excellent walk tonight. Sometimes it's super easy to get into "stroll" mode. I stayed in "brisk-I got somewhere to be" mode. For most of us, I believe there are two different sides of resistance along this path we share. The food addiction side, where we hopefully identify a particular substance initiating the addictive reactions in our brain, and we apply sound recovery principals in that direction (mine is refined sugar). And then there's the emotional/stress eating side of our equation, where eating becomes in ineffective tool in our attempts to handle emotions and stress. These two sides are not one in the same. And it's completely possible to be an emotional/stress eater and not a food addict. I know many who would fit the mold of someone who regularly handles stress and emotions in the nearest drive through, yet, they wouldn't be considered a food addict by its purest definition. On the other hand, almost all of the people I know who are self-proclaimed food addicts, many in successful recovery, are also emotional/stress eaters. Without a shred of doubt, I'm both. For someone like me, any and all success ultimately takes a two pronged approach. I've written extensively about my abstinence from sugar and the life changing results it's gifted me, but that's not my focus tonight. My abstinence continues to be strong, sacred and non-negotiable. My focus tonight is stress. My stress level has increased exponentially over the last few weeks. Work stress, stress I'm creating as I make time to focus on personal and professional projects and various other personal things!--all contribute to this uneasy-unbalanced trek forward. 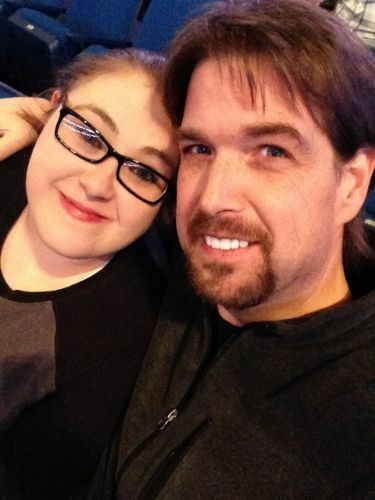 And my oldest daughter is getting married at the end of May! I'm on guard. If my resolve had a DEFCON number, five being smooth sailing and confident and one being extreme and imminent danger, I would say I'm at DEFCON 3. Have I had thoughts of cutting loose on a binge in a foolish effort to somehow make everything better? Of course. That's been the pattern 85% of my life. I'm really good at it. But we know the truth about emotional/stress eating. It doesn't fix anything. It's a detour into a state of pleasure where the troubles of the moment are not fixed, they're ignored. And when the plates are cleared, the troubles still exist, only now we have the added feelings of guilt and shame. Instead of fixing or at the very least, distracting us from the stress--it only serves to compound the stressful and emotional triggers. Any reasonable person can understand how this dynamic quickly becomes an out of control spiral. Knowing the truth isn't the best defense. The truth can be ignored, for a while, at least. The best defense is good support. Sharing what you're feeling--it's what I'm doing right now and the therapeutic benefits of writing it on the screen brings an immediate refresh and calm. Reaching out to support buddies--sending that text, making that call--it helps. It's working wonders for me at the moment. My calorie budget has remained solid throughout and it's certainly not because I'm some strong super-human weight loss machine. I'm not even close. I'm human and exceptionally experienced in all of the ways to go off the deep end. I'm making a stand, my friend. I'm not taking that deep end dive. I'm reaching out for support instead. I'm writing about it in a way that was always the purest intent of this blog from day 1. It's getting me through. I'm grateful. After a long day at the studio, I headed home with an unapologetic intention to nap well. Oh wow, I'm really good at napping, too. I handled my nap this afternoon like a champ. I made it ten more minutes into Marc Maron's WTF podcast before I was gone. It's interesting, I started drifting when Marc started discussing his lifelong internal struggle with emotional/stressful eating, his dismissing it as largely circumstantial while on the road and the more damaging self-loathing he experiences every single time he does it. I'll go back and give that a listen one more time. I love Maron. Not just because of my former career as a stand-up. That commonality is like a bonus feature for me to enjoy, especially when he's interviewing or speaking of someone I worked with along the way. I listen to him and I find myself relating to so many different aspects of his experience and psyche. I woke feeling refreshed and ready for the second part of my day: A good meal, a good workout, some good support interactions and a good blog post. I feel better. I shared something today in a one on one exchange via email and I wanted to share it with you, tonight. Do we wake feeling excited about what we're doing and where we're going or do we wake dreadful of the elements we're doing each day? That's a really good question. If we're starting each day dreadful of what we're doing, it's a great idea to change what we're doing. It all goes back to finding what works for us, not just in terms of what brings us results when we do it, but what fits our groove best. You can get awesome results doing a lot of different things. The things you enjoy, the things that best fit your tastes and speed, those are the things that will help you find your groove. Once we find our groove, it's much easier to get excited about the future. What do we dare dream? Anything and everything, it's your dreams--it's limitless. There's no comparison to anyone else, there aren't any small dreams. Each and every one is important. Visualizing a future where your success enables you to take less medicine, or none each day might be one. Visualizing a future where you finally try out rock climbing or anything else you've avoided because of physical limitations...Think about it--and get excited!!! Today was a good day. I ate well and exercised really well. I engaged in support with others, both giving and receiving and I did a little cleaning around this apartment of mine. I'm always impressed by the positive feelings generated by housecleaning and general organization. I really should clean and organize a little more often! It felt great. I accomplished some things. Yay! This is my seriously passionate look. I can't help it sometimes! I'm full of passion for this road we're traveling. I don't know it all and I have much to learn along the road ahead. All I have today is the sum of my experiences to date. I'm looking forward to adding to those experiences! Let's make this week phenomenal. Who's with me? Taking a rest day today and letting the Tweets handle tonight's blog. I took a nap incredibly late afternoon/early evening, after an exceptionally long day. The work day was capped off with a location broadcast from a car dealer. One of the big draws during the broadcast? Free cookies and soft drinks! It's perfectly okay--and I'm beyond fine being around stuff like this. It truly doesn't entice me in the least, for reasons I've written extensively about of late. That nap--yeah...a little after 6pm until almost 7:30pm. A friend of mine thought I was crazy. But I felt it necessary and that's what matters. Had it been a night before a 4:30am alarm, different story. I will sleep-in a little while tomorrow morning. I hit the trail for a 5K tonight. I ended at 2.7 miles instead. It was just too late and I was feeling too tired. Three laps was good for me. I did something unusual out there tonight. Well, first of all--it's strange that this was the third Friday night in a row at the trail. A pattern seems to be developing. The unusual thing? I walked in silence. I did this a couple of times before a very long time ago while walking in the early morning. I wanted to hear the birds sing their morning songs. Tonight, I was simply enjoying the stillness of my surroundings. I was the only soul out there and it was incredibly peaceful. It was breezy and cool with some low level clouds racing Northward at what seemed to be an unusually fast speed. The only things moving in the park tonight were the trees, the clouds and me. Two different location broadcasts for my Saturday, so I better drop in bed. Oh, one more thing. Leah, a regular reader and fantastic loyal supporter from Canada, posted a link on her Facebook page to a segment on the CBC television series, Marketplace. It was all about gluten free products. I'm aware that only 2% of people suffer from celiac disease--and these people must avoid gluten 100%, or they get incredibly sick, fast. The questions asked and answered revolved around, Is it necessary for non-celiacs? What's the financial and nutritional cost? What's fueling this massive trend toward g-free? It was extremely informative, entertaining and it helped me make a decision. I'm ditching the gluten free products I sometimes use. I wasn't ever 100% gluten free anyway, so really, what was the point? I'm the first to admit I don't know everything about nutrition, not by a long shot. This report was eye opening. I really hate to admit being suckered in by the big marketing efforts behind g-free. For those with celiac disease or people with a milder discomfort known as gluten intolerance or for those who avoid wheat the same way I avoid sugar, gluten free is a great idea. For me, gluten free isn't necessary. I didn't realize tonight's g-free pasta would be my last, but I suppose it was. OMGoodness...I must pick up some Joseph's Pitas this weekend! Third Friday night in a row I've found myself at the trail for a 5k. It's super late, but after a good nap earlier, this works for me. Yesterday and today have been very special days to me. Yesterday's one year weigh-in and the tremendous outpouring of support and congratulations, was a tremendous blessing. I'm blessed. I'm grateful. And I honestly feel like I can say, without any doubt, without any fine print: I've given it my best effort. The spiritual support and the support of an army of others along this road have made it very clear to me, we're never alone. Even during the self-isolating nature of relapse and regain, we're not alone. It can certainly feel like it, but truly, we're not. When we open our heart, mind and eyes and we fully realize this, it's the most refreshing feeling. I'm going to be okay. I'm going to make it after all. Yes, you are going to make it. How refreshing is that feeling, realizing it's going to be okay and you're really going to make it? Below is the text of an email I sent Marty Lerner Ph.D. at the Milestones program in Florida. Marty is a world renowned expert on food addiction. This email was dated March 27th, 2014, three and a half weeks before starting this turnaround in earnest, three and a half weeks before feeling renewed and refreshed. I think I may need in-patient treatment. How much is inpatient treatment at your facility? I likely can't afford it, but I wanted to see what's available. That was an email from someone throwing up his hands and saying, I can't do this on my own, I need help. It was the beginning of yet another surrender, this time in the most humble and powerful of ways. I guess the trick is to just keep surrendering until you lose the things preventing a full and complete experience, for me, pride and ego. Life Coach Gerri Helms has been an angel to me. Gerri has twenty-one years of maintenance and twenty-one plus years of abstinence from sugar. That, is successful recovery. In all of her years, she's worked with many people through their struggles and successes along this road. She knew exactly what was happening even when I thought I was doing a fantastic job of pretending it was all okay, she knew better. And she wouldn't give up on me. She's a dear friend. Today marks 365 days of continuous tracking on MyFitnessPal. 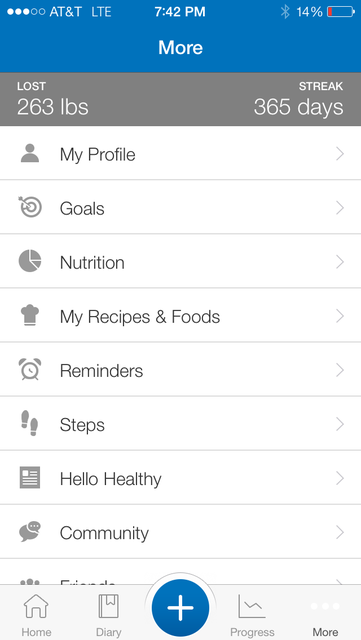 If you're on MFP, feel free to "friend" me, my username is: SeanAAnderson My food diary is public. If you ever see a meal tweet and you're curious about the particulars, you can find it in the diary. This is my happy/relieved/refreshed look. I'm so incredibly happy things have unfolded this way. Isn't it interesting how what is once perceived as one of the worst things, turns out to be a critically important element contributing to the development of the best things? It was a very busy day today. I haven't had a rest day from exercise in a week, so making today a rest day after seven days straight, was perfect. I didn't fully commit to it being a rest day until this evening. I was relaxing with a great cup of coffee and I thought, I really don't want to put my shoes on again. So I didn't. One more thing before I turn out the lights and go to sleep. As reflective as the last two day's posts have been, this isn't necessarily a celebration, it's more of an acknowledgment--an opportunity to pause and be grateful, give thanks and continue on in the same way that brought me this far. Today was my 52 week weigh-in. Before we get to that, I thought I would go back in time to April 19th, 2014. That date was ten days after I stepped on the scale to see 394 staring back at me. It was happening. 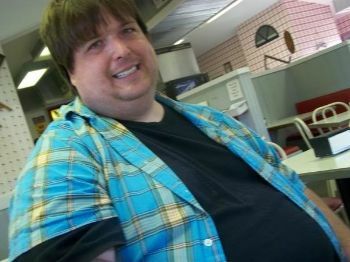 My worst fears were manifesting, quickly, with the encouragement of regular binge episodes, I was heading back to 500 pounds. I was regularly trying to get a handle on it, but it was as if my hands were covered in grease. I couldn't get a solid grip. I would be okay, do well for a few days, even log my food, then crash, binge and give up, again, until something grabbed my attention, again. This turnaround from relapse and regain over the last year has proven to be the most transforming for me, mentally and emotionally. Physically, too, sure, however--aside from the internal health benefits, the outward physical transformation in appearance is truly the least of it all. There's an interesting psychological dynamic that unfolds when you lose a dramatic amount of weight and then gain some of it back, or a lot of it back. I'm convinced this dynamic is exactly what makes successfully losing again seem more difficult. Suddenly, it becomes much more than controlling our calorie budgets, exercising and paying attention to our emotional state and the accompanying triggers. Now, we must do a little more "mental work" as we do our best to get past the guilt, shame and embarrassment associated with weight gain and put our focus squarely where it's most benefiting. 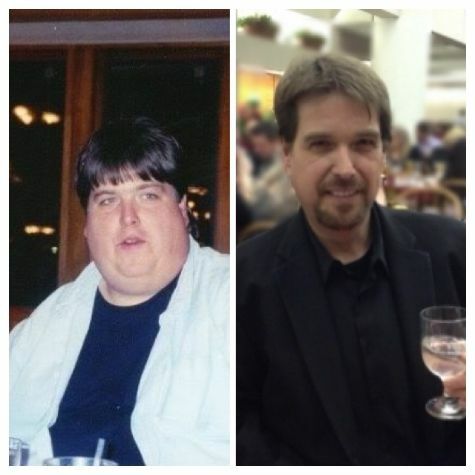 This dynamic is powerful no matter if you blogged about your weight loss and wrote a book or not. I was in line at the grocery store the other day, fighting the urge to grab a dose of sugar, when a man came up behind me in line and said, "Sean Anderson, I read your book. You've gained some back." Two things happened in that moment: 1. I immediately lost any desire to grab a Snickers bar and 2. I felt a rush of guilt, shame and embarrassment. Now, most people operate with a better set of filters. This scenario has played out more than a few times, but usually the other person doesn't vocalize the obvious. Even when the obvious isn't stated, I'm real good at deciding exactly what they're thinking. The silent-mental conclusion is always much more harsh and unforgiving and likely inaccurate. As this blog moves forward, I'm going to get into more of a "diary" type mode, much like in the beginning. Less "here's what I think" and more "Here's what I did and am doing." I'm excited at the idea of getting back to the roots of this blog. Back to a diary in the purest sense. You see, I tend to suffer from paralysis by analysis. I try to understand things from every angle, take it apart, dissect the elements, reach conclusions, maybe write about my personal philosophical conclusions and then when I struggle, it's back to the drawing board. We can study ourselves and learn, learn, learn--the applying part is the critical step that's often times hindered by the exhaustive analysis. Much like advice I've given a hundred times to others: It's time to stop trying to figuring everything out and just do. Just be. And be okay. And move forward. I'm incredibly grateful for this entire experience, even the relapse and regain. Without this path, I would have missed out on the good stuff. The stuff I needed to learn, the stuff I needed to appreciate. And there's still more stuff to learn along the way as I proceed toward maintenance mode, quickly, with the encouragement of the fundamental elements I hold sacred each day. Another 5 pounds down for this three week period, bringing the 52 week total to 152 pounds. Days like today send me into a heightened sense of focus and determination. I do better at my job, I reach out more, offering and receiving support, I eat well and exercise in a crazy fun lip syncing zone where I block out anyone and anything around me and I just get deep into the music. I swear, the regulars at the Y probably think I'm crazy. And that's okay. I'll be the crazy guy who lip syncs on the elliptical and takes pictures while refilling his bottle of water, all day long. I'm also aware that not every day will be like this day. It's never been a constant string of great days. And when the blues come a callin' again and everything seems off center and on tilt, it'll be up to me to lean on my fellow travelers for the critical support I need to make it to another great day. I've discovered I can still be under general stress with work, finances or anything else life throws my way, and simultaneously feel genuine excitement about what I'm doing in taking exceptional care and about where I'm headed. It's noteworthy because there was a time when I thought everything needed to be perfect in my life before I could somehow experience success with weight loss. How does a lifetime stress and emotional eater successfully lose weight? Turning to food for comfort and escape became my solution for most everything. Only if my back was up against the wall or I felt cornered would I actually deal with something head on. This pattern resulted in a bunch of unresolved issues over the years and it kept me "comfortably" in the 500 pound range. One of the many epiphanies helping me get started on this weight loss path in September 2008 was the realization that losing weight would require putting down my shield. I would need to feel and deal with things in a different way. Deep down, I knew the excess food wasn't helping anything. I wasn't eating for it to help. I was eating as an escape to something pleasurable, a distraction from the unpleasurable. Food helped me do that. But it didn't help the issues creating the stress and emotions in the first place. Once I fully appreciated and understood this and what it meant, I really thought--okay, that's it, I'm fixed!! I'll never do that ever again!! Well, famous last words, huh? A combination of emotional issues and stress overwhelmed me after maintaining my initial weight loss for a year and a half and just like that, I intentionally ignored the truths of what I had learned. I stopped being accountable, I stopped writing, I turned my back on support, I stopped caring about whether or not I was handling things appropriately and I started isolating...and eating. Some of the powerful epiphanies along this road cannot be forgotten. As in, you can't un-know them. You can't see and experience the truth, then ignore the truth, without the truth nagging at you every step of the way. Someone once said, "recovery is a buzz kill." Very true. I could no longer wallow in pure unadulterated oblivion, doing what always came natural, without constantly being reminded of what was really happening. Tomorrow morning is my 52 week weigh-in and Thursday will be Day 365 of this turnaround from relapse and regain. I've learned volumes more about me over the last year. I've learned about what it really means and feels like to apply a sacred level of importance to this recovery process. In order to be successful, long term, I must give the elements of what works for me the same reverence an alcoholic in successful recovery gives theirs. I thought I realized the power of support before, but oh wow, I've been gifted an entirely fresh and powerful perspective on the importance of giving and receiving good support. When I say "I'm excited about where I'm headed," it's for so many different reasons than before. I'm not most excited because of a new pair of jeans that will fit soon. I'm not most excited about some hot new romance someday. I'm not most excited about the success of my future projects or the desire to eventually make writing, mentoring and public speaking what I do full time. I'm most excited about once again approaching maintenance mode, and this time with a grounded and completely different perspective firmly rooted in solid recovery principals. With an understanding and full appreciation that I'm never cured. Relapse and regain humbled me in a most beautiful way. I needed the experience. I'm grateful. I spent quite a bit of time replying to emails and comments this evening. Thank you, sincerely, for each and every one. This entire experience has been incredibly rewarding. When I recently included a flashback excerpt from a year ago, right before returning to daily postings, one of my favorite parts was "it might get a little boring." This was my way of alleviating a self imposed need or pressure, if you will, to explore and elaborate nightly on anything and everything related to this road so many of us travel. I've experienced and learned so much along the way, sometimes I can't help myself and I must share what's on my mind. It helps me dissect things and truly understand how it applies to and informs my entire experience. Some of it might not apply to you and some of it might hit you square. I always look forward to sitting down and writing without constantly checking the time and hurrying along. Other times, like tonight, I have to call myself in from the pleasure of writing with a big, "it's time to go to bed!" This is a sign of growth in me over the last year or so. Including the Live Tweets from the day in each post has been a big help! This weekend didn't go quite as planned, but that happens. I made needed adjustments and made it through in fine form. It was a really good weekend in a lot of ways. I feel strong. I've written extensively about the difference abstinence from sugar has made in my life. I'm serious when I say it is the single most important nutritional decision I've ever made. It's been a life changer. Turning off the "binge switch," receiving a peace and calm like I've never known, is very real. Before I gave it an honest attempt, I listened to people share their amazing experience, I read blogs and articles all describing the benefits. I didn't fully appreciate any of it until I experienced it first hand. My sugar abstinence is just a few days shy of a year old. My commitment only gets stronger each day. I was eating lunch recently with a loved one who ordered a dessert and then told me how horrible they felt eating it in front of me, because "I know you can't have any." I assured them it was perfectly okay and their dessert wasn't bothering me in the least. The truth is, If I wanted it, and I didn't mind sacrificing everything important to me, I could have it. I've worked too hard turning my relapse and regain around to give it all back, again. And it's that kind of importance level that will help keep me in successful recovery. I don't want it. And it's not about will power. I've written this before--and it's very true: Will power is only used when you're resisting something you desperately want. If you don't want it--with zero desire, will power isn't employed. I don't eat broccoli, ever. I tried it one time. It isn't will power that keeps me away from broccoli. I don't like it and I don't want it--that's what keeps me away. When I see sugar, I see poison. It doesn't take will power for me to resist ingesting poison. All it takes is knowing that it's poison to me. It isn't poison to everyone, mind you, but for me, yes...it is, very much. I wouldn't dare trade what I've found for all the Snickers Bars on the planet. You could eat the most decadent dessert in the world, right in front of my face and it wouldn't bother me in the least. People bring donuts and cinnamon rolls to work occasionally--doesn't phase me. Girl Scout Cookies--FREE Girl Scout Cookies lived in our kitchen at work for the longest time before somebody finished them off or threw them away, I don't know which--but I do know I faced them each and every day as I prepared my breakfast and lunch in that kitchen and not once did I have a twinge of struggle toward them. Each day I abstain, my commitment grows stronger. I enjoyed reading every single word of her post. The enthusiasm--the sheer excitement she expresses because of her experience, was a most wonderful read. Her experience with abstinence from sugar mirrors mine down to the letter. I immediately asked for her permission to share it here and add her blog to my blog roll along the left hand side of the page. Holly got back with me today and gave an enthusiastic yes! I hope you'll read her post. It's beautifully written. I did more weather coverage at the radio station today. 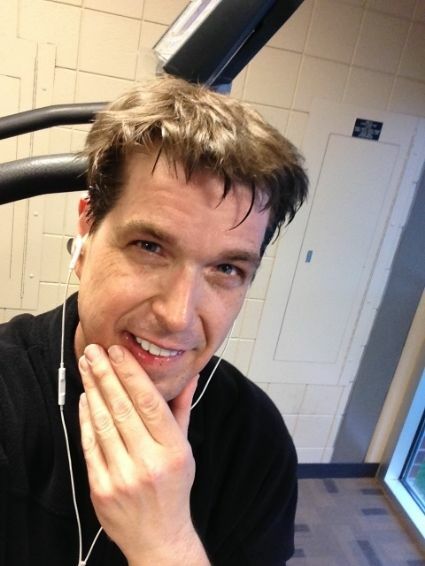 Just when I thought I might need to employ a Plan B for exercise, the storms moved on, replaced with a cool calm--and just enough time for me to get into the YMCA for a workout before their 6pm closing time. My dinner tonight (see tweet below) was the second time I've made the dish and it's immediately one of my favorites! And one more cup. Same cup, refill. ;) sf hazelnut. 30 cal.